← AR Drone 2.0 repair why bother? 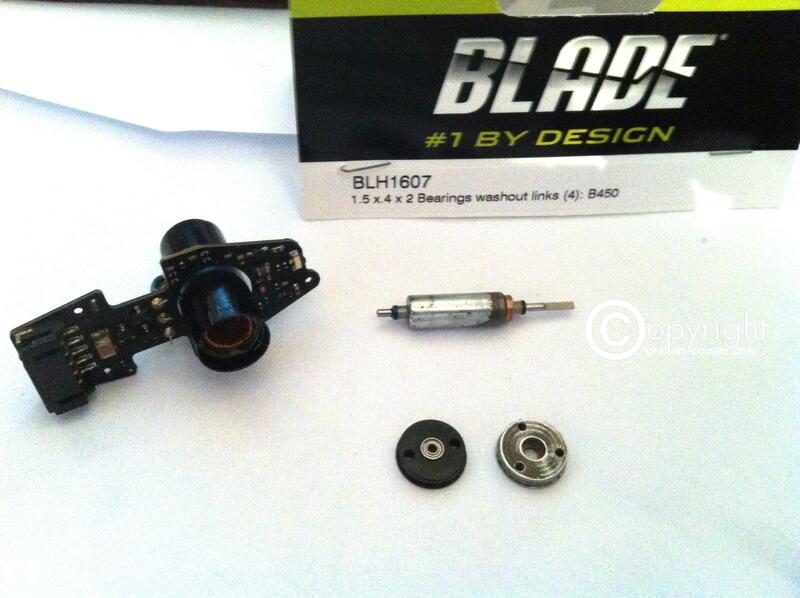 On my refurb of a rusted ole AR Drone I obtained, I got a new set of bearings from Blade (BLH1607). These bearings I have used before and so I ordered some more to fit to these 4 rusted motors. Getting the motors apart involves using a weller gas hot air gun and heating up the top and then turning over the motor held with pliers etc and tapping the bottom where the shaft slighty sticks out with the plastic end of a screwdriver until the top begins to part and then gently and carefully grab it and pull it off. Be careful as the wires that go into the motor and to the pcb are fragile! The old bearings were rusted in solif to the top and bottom caps and were a pig to remove! Tapping out bottom bearing also the bottom cap came off, probably the glue was also weakened by the heat. The actual shaft and magnet were as you can see in picture rather rusted and I used wire wool etc to clean them of rust. Anyway new bearings with a drop of oil in them were fitted back and then the top and bottom caps were glued back on with Super glue and seemed to freely spin again , so fitted them back to the drone and ran up motors while holding the drone underneath and all seemed fine. So new bearings and time and patience got these 4 motors running again. Again main reason to attempt this was 4 x new motors which come soldered to new esc’s would be around £100!! This entry was posted in AR Drone 2.0. Bookmark the permalink.